This month I had the absolute pleasure of chatting to award-winning playwright Rory Mullarkey who recently translated Anton Chekhov's 'The Cherry Orchard' which is currently being performed at the Royal Exchange Theatre (19th April - 19th May 2018) - shout out to Justina for making this happen! I would not consider myself an expert on Chekhov's work but having now seen two of his plays (Uncle Vanya and now The Cherry Orchard) and discussed 'The Cherry Orchard' with Rory I can confidently say I am getting to know him a bit better - well, the ideologies plauging him at the time at least. 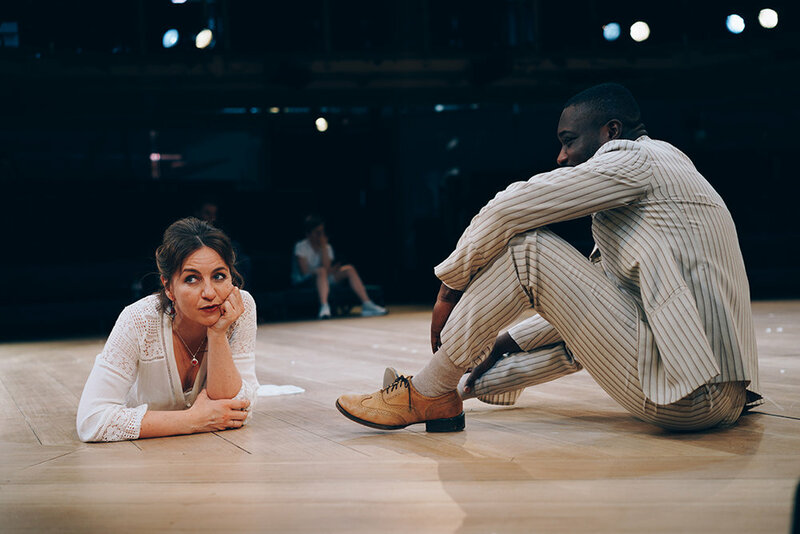 Lyubov-Andreyevna-Ranyevskaya (Kirsty-Bushell) and Yermolai-Alekseyevich-Lopakhin (Jude Owusu) in 'The Cherry Orchard' as performed at the Royal Exchange Theatre (19th Apr - 19th May 2018) || Photo by Liam Bennett - courtesy of the Royal Exchange Theatre. Armed with a phone and a recorder on a Tuesday afternoon, I "grilled" Rory on how he came to be playwright, his work as translator of theatrical texts and his experience translating 'The Cherry Orchard' which he considers to be "... the greatest play ever". Scroll up (... or is it down?) to have a listen. After studying languages at Cambridge, of which Russian was one, Rory had a brief stint at the State Theatrical Arts Academy of St. Petersburg after which it became clear to him that his passion lay with writing plays and not acting in them. He then got a job as a translator at the Royal Court Theatre, was a Pearsons Writer in Residence at the Royal Exchange Theatre and also won a handful of writing awards along the way such as the 2014 George Devine Awards (with Alice Birch) & the 2014 Pinter Commission Playwriting Award for his play 'The Wolf From the Door' and the James Tait Black Prize for his play 'Cannibals'. And this summer, under the direction of Sam Pritchard, his new play 'Pity' will be premiering at the Royal Court Theatre (12th Jul - 11th Aug 2018).